The new Brookfield SUPERDRILL is an all-in-one machine with tested and proven success in the field for stubble control, moisture retention, weed management and planting. 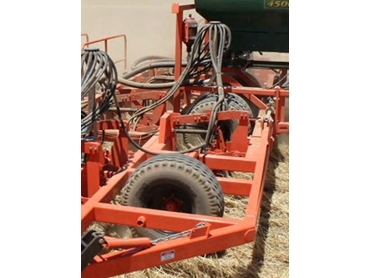 Similar to the CHAINBAR model in all its chains and tooling options, the Brookfield SUPERDRILL is essentially a disc seeder with proven success in the field sowing cereals. However, the Brookfield SUPERDRILL goes beyond disc seeding duties to perform a whole range of functions in the field. Combined with the trash handling abilities of the disc chains, the seeding discs can be lowered into the ground to cut stubble. The machine’s proven performance across all seasons makes farming operation profitable for the operator. Key features of Brookfield SUPERDRILL disc seeders include superior chain tensioning, reliable customer service, wide variety of proven applications, Disc, Prickle and Dogleg chains available, small seeds application kit, chemical application kit, and minimum and zero till options available on the same machine.